For a brief moment last week, we were spared the usual bluster about asylum seekers from politicians and commentators. But with the gloves now off we learn that the recent deaths at sea were the fault of Julia Gillard, Tony Abbott, Kevin Rudd, Malcolm Fraser, social justice advocates, the moralising left, the right, the Greens, the carbon tax, and apparently me. Trying to shame people with blame in the aftermath of a tragedy can be a self serving exercise and much of what is written serves only to reinforce tired political agendas. But all of us must accept some responsibility for the debacle that is Australia’s approach to asylum seekers and we must work together to find solutions. In Saturday’s Age, Nick Dyrenfurth took aim at refugee supporters, who he claims have failed in their moralising about refugees. But Dyrenfurth is just another in a long line of commentators to preach his own brand of morality and to denounce others with the claim that he knows something the rest of us have failed to notice. One thing I learnt quickly when I entered the refugee debate many years ago was that everyone is an expert. But it should be mandatory for anyone writing on the subject to spend solid time in detention centres before calling on others to sugar coat their views and to research the multitude of campaigns and contributions to a debate lasting more than a decade. Dyrenfurth ignores the hard and sometimes invisible work of Australians who have given up time, money and personal lives, to try to shift public perceptions – often successfully - and assist refugees over many years. But more problematic is the refusal of our politicians to acknowledge or take steps to address a refugee’s dilemma before he or she steps onto a boat. Too poll driven to even explain the human desperation that leads to boat journeys, our major parties swing with the most favourable political breeze. When Kevin Rudd came to power in 2007, many Australians hoped he would position boat arrivals within the global context that John Howard had refused to provide. But Rudd failed to live up to expectations, preferring to appeal to voters on all sides of the debate with his focus on the ‘vile’ people smugglers. The Coalition has been similarly motivated and with each tragedy comes the message that Coalition policies aim to save lives. But only the naïve could believe that cries to ‘stop the boats’ are anything more than a pitch to particular Australians; those who don’t necessarily lack compassion, but are more concerned with improving their own lives. Last week was Refugee Week in Australia; a time to focus on the needs of millions of refugees worldwide. But Shadow Immigration spokesperson Scott Morrison had little to say about desperate people and chose instead to converse on Sydney radio about refugees arriving with jewellery and “wads of cash”. It was a grating reminder of Philip Ruddock’s past attempts to defame refugees with claims that they threw their children in the water, asked for two-in-one shampoo, double-dipped with charities, or purchased mobile phones. After years of stuff ups and severe damage caused to refugees under John Howard’s leadership (resulting in millions of dollars in compensation), Australians were seeking a more humane approach. And for a time, the Coalition was happy to play along. But as the boats kept coming and the tabloid pastime again kicked in – focusing on anything but the tragic stories of the people on the boats -Tony Abbott arrived to resurrect past policies. Abbott’s populist approach has forced the Government to embrace the Pacific Solution it once found so repulsive, but his stance is now so bizarre that he is denying support for his own Nauru policy. And his opposition to a Malaysia arrangement stands in stark contrast to John Howard’s attempts to send refugees from Nauru to Malaysia, and of course to his own Indonesia push back plan. Never has the Coalition’s obstruction mentality been so clear as in Scott Morrison’s appearance on the ABC’s 7.30 on Monday night. During the interview with Leigh Sales, Morrison indicated that even if the government agreed to all of the Coalition’s policies and dropped its own Malaysia arrangement, the Opposition would still not offer its support. Only if he and Tony Abbott were allowed to govern could these measures be implemented successfully, he claimed. It’s all about getting elected. I would not personally oppose sending asylum seekers to Malaysia under a genuine regional arrangement, as long as adequate protection and conditions, a fair process, legal and human rights, and the potential for resettlement within a reasonable timeframe were guaranteed. But dumping refugees on tiny islands while we wait for their mental health to break down, before bringing them to Australia, makes no sense. Malaysia has a central role to play in a long term regional solution; Nauru does not. It is obvious that the lure of boat journeys would diminish significantly, although not completely, if safer options and more resettlement places were provided for refugees in the region – just how desperate would you have to be to risk death on the ocean rather than remain where you are? But would a focus outside of our borders win votes for either of the major parties? In the short term, probably not. If John Howard had invested in long term regional strategies during his four terms in office, instead of seeking short term political gain, we might today be facing a different landscape. The tragedy of a refugee’s life does not begin when we pull his or her body from the ocean and unless we can provide better alternatives to boat travel we will always end up back here trying to find someone to blame. Susan Metcalfe is author of The Pacific Solution (ASP 2010) and has written widely on refugees and asylum seekers. The "Liberal" Party,regarding the Refugee problem, proudly proclaims, "We have a Solution that Works". By "Works", they evidently mean "One that sweeps the problem under the carpet, or at least pushes it out of sight, so we do not have to look at it too closely." Perhaps the main problem, since "votes" are the determining factor, is to educate the Australian people about the real position of the Refugees, as helpfully portrayed some time back by an ABC program about visiting holding centres. Any political solution while so many people see only the negative side of accepting Refugees is bound to be flawed. A lot more money and work is needed beyond processing and accepting refugees if they are to be successfully integrated, but Australia has the available resources, and hopefully the result will then be a win-win situation, both for Australia and for the Refugees. Here we go again! I am very angry at people like you giving support to the murderous people smuggling industry. It seems that people like you have no shame, no feeling of guilt and are driven by selfish chest beating hypocritical self rightness. I fail to understand that people like you actually manage to sleep. You know as much as the rest of us that people smuggling is a profit driven industry. People smuggling and its support network is as evil as slavery and must be stopped! Susan Metcalfe is right. A regional solution that recognized that those who take to boats do so because they cannot find a safe haven elsewhere. It is a desperate attempt to find a futre for themselves and their families. If you are an Hazara in Pakistan, you are increasingly at grave risk from both Afghan and Pakistani Taliban. You ahve no protection by the state there. You cannot go back to Afghanistan where Porfessor William Maley states there is no safe place for Harazas to be returned to. You cannot even approach UNHCR sub office in Quetta to join that mythical queue as your very appearance as an Hazara singles you out for assassination enroute. What do we expect them to do? Even the slight hope that they may reach Australia and find a haven there is seen as better than the constant terror under which they live as Shiite and Hazara where there is an ongoing persecution of their people. A regional solution is their only hope. Some place they can join that mythical queue where countries in this regoin, Australia at the head of the queue, do recognize their staus as refugees and take a fair share of those we presently prefer to demonise. They do not have a safe refugee camp to wait safely in. Australia is the first country signatory to the Refugee Convention that they have any cyhance of reaching. We could through decent regional cooperation save them the lottery of boat jouneys that can end as disaterously as the recent tragic loss of life. We did it with the outflow from Vietnam after our involvement in a war there. We can do it again after our involvement in another war that sadly has not brought any light for Hzaras in or out of Afghanistan. There may be no simple and helpful answer to the complicated question of dealing with ‘boat people’ but we should try to find some solution, even if imperfect. There is also the larger but less publicized problem of helping those who have neither the money nor opportunity of escaping victimization in their own countries. Pressure is currently exerted on nations that are deemed to be acting badly in various other ways and perhaps greater concern – and action – is needed to reduce the causes that turn people into potential refugees. This might best be done by more effective use of the United Nations, which would have greater authority and international recognition than piecemeal action by individual countries. More attention must be given to eliminating the causes rather than looking simply at the symptoms. Unlike Beat "here we go again' Odermatt, I don't believe all people-smugglers are evil. Some might be, but others are helping desperate people get to a place of safety. They and their customers are not helped by the vandalistic Australian government's destruction of their boats if they do make it here. This attitude discourages the owners from making them really seaworthy and safe, and forces them to charge their customers more. It might seem unthinkable to let them have the boats back, but it would save lives and money. You make numerous valid points, Susan .Thank you. To 'stop the boats' the Australian Government would need to 'stop the persecution' of minority races within their own countries. A truely tall order.Australians generally appear to have little ability to imagine what persecution may mean. We are signatories to the Convention on Refugees and thus bound to accept those who successfully reach our shores. Basic funding to ensure seaworthiness of vessels from Indonesia (as their staff have NEVER been smugglers) will guarantee safety as the refugees complete their journey to Australia. Basic commonsense then would reinstate the policy of the 1950'S immigration scheme and engage all new refugees to arrive into a program of indentured employment for a given period of time( 3 or 5 Years) whereever there is need. Funding from: the various imprisonment schemes, the outsourced guards schemes and the bulk of the skilled migrant importation schemes should easily cover it.Obviously there is need for a health and security detention scheme for no more than 3 months which then allows time to arrange deployment to diversified sites. We still benefit today from the widespread businesses of erstwhile migrants, thus avoiding the problem of ghettos. This article ia another "hit the coaltion" piece where the author places a very nebulous blame on Tony Abbott and the Lib/Nat coalition who is in no position to affect the Labor Party policies that the Australian Government is now pursuing. The author seems to forget that it is Labor, not the coalition who has power to formulate policies for the best interests of all Australians. It is Labor not the coalition who has idly let many problems escalate since attaining power. "These illegal entrants are clearly abusing our system, most of them have friends or relatives here and are doing as what they are told to do, destroying all identifications before landing in Australia, which they carry until they reach Australia, demanding benefits, demanding free legal system. Above all, the system abundantly rewards people smugglers who are reaping millions of dollars. This also reduces the intake of genuine refugees. The whole process is so sickening." Thank you and well said, Ms Metcalfe. I do not pretend for a second to have a solution. However, there is evidence that if people know that they will need to wait for a *set* period of time (e.g. 3 years) they will be less likely to hazard a dangerous sea journey to anywhere. A regional solution and a bipartisan approach are imperative. So also is the education of the Australian community about the real circumstances causing the desperation of those who risk their lives to get here. Demonising all of those who transport refugees is unhelpful because the law of “supply and demand” prevails. The boats (and plane-arrivals) will not stop until we ameliorate the plight of the poor wretches seeking asylum. Our accepting many many more than we do currently, thus giving hope, might relieve some (but not all) of the pressure.
" unless we can provide BETTER ALTERNATIVES to boat travel we will always end up back here trying to find someone to blame." WELL SAID. Not the best reply to an article seeking better treatment of desperate people, including their need to take to the boats. Malaysia is not a signatory to the UN Convention on Refugees. This being the case, it is difficult to see how "The Malaysia Solution" could be described as humane, and a way of honouring our international obligations to people fleeing persecution. Abbott's scare-mongering on refugees is truly eggregious - based upon blatant lies and base populist racial vilification. Howard's punitive policies were not successful - unless, of course, you consider the unmitigated human tragedy of the sinking of the SievX in October 2001 to be irrelevant. End indefinite mandatory detention, abide by our international obligations and institute onshore processing whilst genuinely seeking a non-partisan regional solution which addresses "push factors", rather than falsely citing "pull factors"
Here we go again! I am sure that some supporters of the people smugglers industry are just extremely naive. The same nativity was evident during the slave trading days. Simple minded “good” people supported slavery as it helped plantation owners to prosper and it helped to bring Christianity non believers. There is no difference in the morality of supporting slavery yesterday to supporting people smuggling today. These people support a trade which is “good” for some (namely traders), but ends up killing many in transit. I am sure some people do not care and feel anything is justified as long as they can find a way to blame the “baddies” like Julia Gillard and Tony Abbott. I am sure that the whole bunch of people smugglers and all of their supporters have less morals then newly hatched maggots! Well Indonesia and Malaysia have already come out today and told us to get stuffed. We cannot pretend to uphold the refugee convention and then break it to punish a group of random people who don't drown because some others did. By that criteria the Afghan women and kids who were rescued today would be sent to Malaysia to rot forever because some Afghan men died last week even though the groups probably have no relationship to each other. All we have to do is what we have said for a decade, accept those we warehouse in Indonesia and stop the inane prattling about regional processing which is code for they do it because we can't be bothered. So Beat, if you face death you would rather not pay the first person you could find to help you but would rather sit and die? There is no smuggling industry, it is the right of the refugees to get on any vessel they can find and who they pay is nothing to do with us. Susan Metcalfe, wrote that it should be mandatory for anyone writing on asylum seekers to spend time visiting detention centres.There is no need to visit detention centres, normal intelligent citizens already know the majority of asylum seekers come from predominately Moslems nations,who have the money to fly to Indonesia passing many peaceful Moslem nations to eventually pay thousands of dollars to murderous people smugglers (some contributors think that people smuglers are passionate people helping economic refugees). destroying their own identifications and coming to a Christian country that will accept them with handouts of food, accomodation and medication. While many Australian born homeless, have to sleep in the street. This whole debate about refugees is reminiscent of situation of the people in the freezing water, at least as portrayed in the film "Titanic", when, "lest they be swamped", half-empty life-boats kept away from the dying people until they were all dead. The latest knee-jerk political initiative is to set an arbitrary number for the annual intake of refugees, whereas what is needed is a response to actual pressing needs, at least on a temporary basis. Let's correct a few assumptions. Nobody blames asylum seekers for trying to come to Australia. I am sure all of us would try to do the same if we would be in a similar situation, especially if we would have the money and connection to enter Australia via a short cut. The issue is the people benefiting from people smuggling. They know that people will die and they know that other poorer asylum seekers will miss out from entering Australia. Australia has been amongst the 3 most generous nations on earth in helping refugees and the public in Australia has always been open minded and open hearted to help new arrivals. We have however evil, greedy or simple minded people here in Australia helping to make the dangerous see journey attractive. These people do know that people will die, but they find their motives justifies the death of desperate people. The worst people of all are Bob Browns puppets in the Green Party by exploiting the desperation of people for their own political gains. Beat: We have to push away and punish refugees because of the people who make money helping them? It is nothing to do with us who refugees pay or who profits along the way. But it is our business that a foreign prison company is being paid $1 billion to make them suffer when they get here. 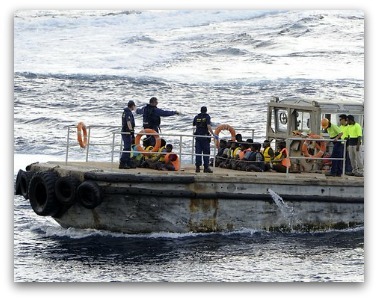 where is the support in this article for people smugglers 'beat'? Too many people neither read or research but rather support a debate filled with uninformed comment. Geeze... describing dangerous sea crossings in leaky boats as a "short-cut" speaks volumes about level of insight, let alone empathy! The death of asylum seekers is the direct result of simple minded and or cruel support of the "modern slave trade". I say shame! shame! There is little difference if you put somebodies head under water until they die or if you support the means of killing such as people smuggling. There is nothing good in this trade, just evil greed and death. The Australian politicians are deceived in this, that they think their choice of lack of right action does them no harm, whereas every sin is more hurtful to the sinner than to the sinned against. Congratulations Susan on your excellent article, and on your humanity and compassion! Surely the answer is for Australia to take in many, many more refugees, and to work closely with our northern neighbours on this issue. The Malaysian solution is far better than the Nauru solution, if off-shore processing is necessary to stop people drowing in the meantime, while plans are made to process and welcome enough refugees to stop the motivation to come by boat. The Opposition are obiously not serious about a solution to the refugee situation. They want the Government to fail on this issue and many others, so they can keep up their campaign of criticism! It seems to me that Tony Abbot and his party are hell-bent on getting into power at any cost, even the cost of the lives of desperte men, women and children, and also at the cost of their own humanity.